We proudly welcome new patients to our practice. If you have questions about new patient procedures please give us a call. Periodontitis is the serious and advanced stage of gum disease, which includes bone loss. The gum tissue and bone that surround and support your teeth could become seriously damaged and the teeth affected could become loose and fall out. 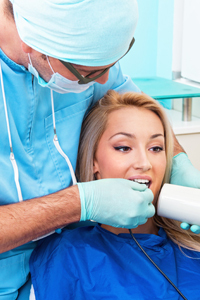 Periodontitis occurs when the early stage of periodontal disease—gingivitis—is left untreated.